Peter T. Johnson, whose leadership of the Bonneville Power Administration in the 1980s saved the regional agency from financial ruin and kept power rates low, died Sunday in Boise after a long illness. He was 82. Johnson was CEO of Boise wood products manufacturer Trus Joist until 1979. 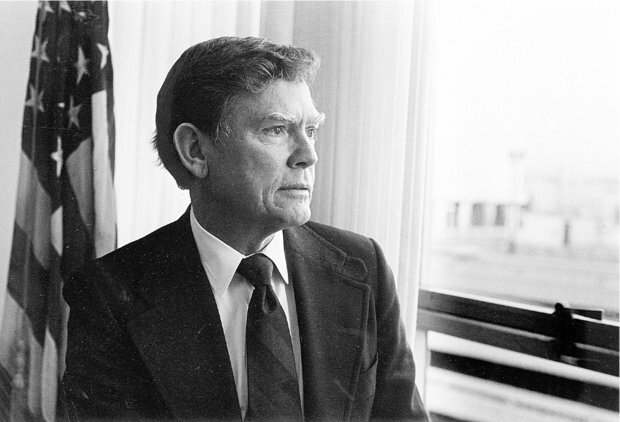 President Ronald Reagan appointed him BPA administrator in 1981, in charge of the agency that sold power from 31 federal dams to more than 8 million residents and businesses throughout the Pacific Northwest. He arrived as BPA was embroiled in a multibillion-dollar nuclear construction program that was careening out of control. The Washington Public Power Supply System's nickname went from WPPSS to "Whoops." Johnson's decisions to stop construction on two of three plants forced 6,000 out of work. But he kept BPA rates low enough for Pacific Northwest industries to survive, allowed the agency to invest billions of dollars in saving endangered salmon and laid the foundation for the region's leadership in energy efficiency. Were it not for Johnson, "We'd still have four nuclear corpses out there, but they would have a whole lot more money embedded in them that we would be paying off," said Angus Duncan, chair of the Bonneville Environmental Foundation and an energy activist in the 1970s. "He was just a keen, bright, talented businessman who wasn't afraid to listen to the facts and make a decision," former Republican Sen. Larry Craig, who served in the U.S. House during Johnson's BPA tenure, told the Statesman on Monday. BPA underwrote WPPSS construction of five nuclear power plants in the 1970s that regional officials said were needed to meet electric power demand. That meant that BPA would have to make good on the bonds issued to pay for the plants, even if they were never built. With overruns combined with poor construction management, costs ballooned to $24 billion and growing. Ed Mosey, who worked in public affairs for Bonneville at the time, said Johnson quickly realized he had to take action or BPA would be forced to raise electric rates so high that the aluminum manufacturers and other industries dependent on cheap power could not survive. In 1982, armed with new forecasts of a big electricity surplus, Johnson ordered the WPPSS board to stop construction on one of the plants already under construction, forcing 6,000 workers to lose their jobs. Workers burned a mannequin of Johnson in effigy. Many in the region's congressional delegation -- defenders of the BPA -- wanted to have nothing to do with him, Mosey said. But Idaho Republican Sen. James McClure, who had pushed for Johnson's appointment and chaired the powerful Senate Energy and Natural Resources Committee, stood by him as he forced all but one of the plants to be halted or mothballed. "Peter looked at it from a business perspective and Jim had a lot of faith in him," said Pat Sullivan of Boise, who worked for McClure on the committee. "That was a very tight relationship that lasted long after he left Bonneville and Jim left the Senate." The region has since invested millions of dollars in energy efficiency -- equal to two Grand Coulee dams, Duncan said. The Northwest Power Act of 1980 framed Johnson's decisions, but it was his courage that kept the crisis from being worse. "He put BPA on a sound financial footing, stabilized BPA's rates and encouraged better use of existing resources in lieu of just building more of them," said BPA Administrator Elliot Mainzer. "He was an iconic figure, whose influence is still present at BPA today." After graduating from Boise High School and Dartmouth College, Johnson served three years in the Air Force before joining MacGregor Triangle, a Boise construction company. He rose to director and executive vice president before joining Trus Joist Corp as president and CEO in 1969. During his tenure at Trus Joist, the company grew rapidly as it introduced a new technology for manufacturing structural building products. Johnson always was ready to make the tough decisions, said Walt Minnick, who Johnson hired and who succeeded him as CEO. "It was his signature quality at Trus Joist and at the BPA," said Minnick, who later served in Congress from Idaho. When Johnson returned to Idaho, he moved to McCall, where he started the Payette Lake Water Quality Council, a nonprofit volunteer organization designed to protect Payette Lake. He served on the Bogus Basin Board, the Children's Home Society Board and co-founded the Idaho Community Foundation. The Peter T. Johnson Wildlife Management Unit includes 60,000 acres of state lands near Lewiston. He is survived by his wife Carolyn; daughters Linda Williams, Laura Shealy, LeeAnn Berry and Lisa Cafferty; and 10 grandchildren. Services have not been announced.